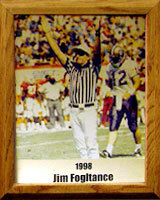 Jim Fogltance graduated from Amphitheater High School, participating in football, basketball and track, and holds a Master’s Degree in Education from the University of Arizona. He has officiated football since 1965 at all levels, including Pop Warner, junior and senior high school, college and the United States Football League (1985-86). He was selected to work playoffs, including championship games, for all levels. Jim worked post-season games in the Pac-10, including the Fiesta Bowl, Rose Bowl, Aloha Bowl, Citrus Bowl, Copper Bowl and the Independence Bowl. Jim also has refereed high school basketball and has been selected to work playoffs for 25 out of 30 years. He has worked the championship game at each level, including three times at the 4-A level and two times at the 5-A level. Additionally, he refereed junior college basketball for six years (1983-89) and has coached Little League baseball. Jim is a sought-after speaker at high school, junior college and college clinics, in addition to various business and social organizations such as Rotary and Optimist.